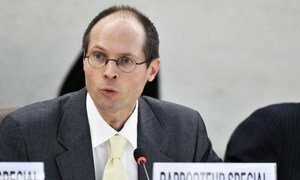 Special Rapporteur on the Right to Food Olivier De Schutter. A United Nations expert urged world leaders today to put the right to food before industry interests when committing to a food security plan later this week at the G-20 summit in Cannes, France, warning of the negative impacts that biofuels and financial speculation have on this basic human right. “The G-20 made an important statement of intent by placing food security at the top of its agenda. But agreeing on a food security action plan without addressing biofuels and speculation would be like running a bath without putting in the plug. All of the good ideas simply drain away,” said Olivier De Schutter, UN Special Rapporteur on the right to food, in a statement. Mr. De Schutter called for governments to put an end to biofuel mandates and subsidies as they are a major factor that causes food prices to rise and creates a high demand for farmland in developing countries. “Leaders are yet to prove that they heard the joint recommendations of international organizations five months ago, which urged G-20 governments to stop subsidising biofuels. It is not enough to name-check the issue – the G-20 must put the human right to food before the vested interests of some of its industries,” he said. Mr. De Schutter also called for leaders to put financial regulations in place to stop speculation on food commodity prices, making them rise unnecessarily, and said the action plan agreed by G-20 agriculture ministers in June is too weak and requires a stronger stance to have an impact. In addition, Mr. De Schutter said food reserves can be used to stimulate the growth of small farmers, prevent famines, and bring stability to the food market. The expert warned that unless bolder actions are taken, the world will be unable to feed the nine billion people estimated to inhabit the planet by the year 2050. “Time is running out for world leaders, who must go beyond rhetoric and deliver real change. The hungry cannot wait,” he said. The practice of “land grabbing,” exemplified by biofuel production, large-scale infrastructure projects, carbon-credit mechanisms and speculation, is threatening food security for hundreds of millions of people by imperilling small-scale producers, a United Nations independent expert warned today.